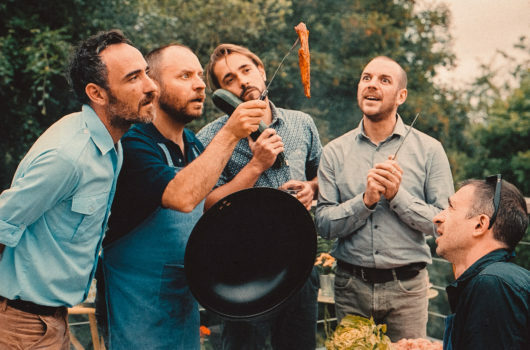 Born Bad Records - BB110 CANNIBALE "NOT EASY TO COOK"
(ENGLIH BELOW ) Si les membres de Cannibale rendaient leur petit-déjeuner au moment de parler de « Not easy to cook », l’auditeur serait bien surpris. 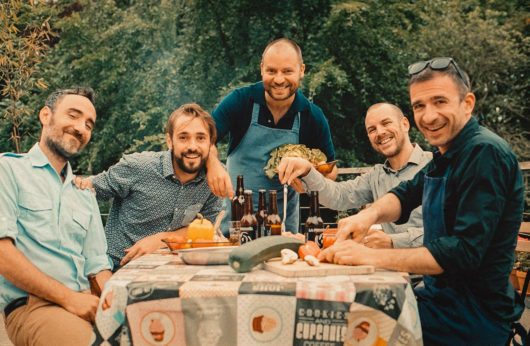 Les quadras étant signés chez Born Bad, on penserait Garage et look à la Didier l’Embrouille, mais on se retrouverait avec des bouts d’Exotica coincés entre les dents, le « Jungle Obsession » de Nino Nardini & Roger Roger étalé sur la table et du Glam tropical en bouteille plastique dégueulé par une version encore plus débile que le Mike Myers de Wayne’s World. Le décor est planté, vous êtes bon pour tout nettoyer. 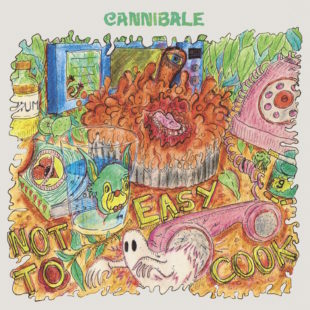 If Cannibale’s members brought their breakfast back up when talking about “Not easy to cook”, their listeners would be surprised. These fortysomethings being signed by Born Bad Records, the image of greaser-looking garage rockers would come to mind, but with bits of exotica stuck between the teeth, Nino Nardini & Roger Roger’s “Jungle Obsession” spilled on the table, and plastic-bottled tropical glam puked by some even more stupid incarnation than Wayne’s World’‘s Mike Myers. The stage is set, now you have to clean up everything. Why mention all this? Because there’s a world of difference between the beginning of Cannibale’s success story and this second album. It wouldn’t take much to feel as if Freddie Mercury showed up in a Renault 16 supersport to play marimba for old oafish rock fans. And actually, that’s about it: The Rocky Horror Picture Show meets Fela Kuti in rain boots. See, Johnny Hallyday himself did not get such media coverage! So what’s Cannibale’s secret? Being old and giving 19-year-old kids who just discovered marimba tutorials on YouTube a thrashing? Certainly, but it’s a little more than a band of old fogeys. “The band learned it all on the road in less than two years,” says Born Bad’s Jean-Baptiste Guillot. Songwriting-wise, they’ve known how to do for a long time. The members – survivors of various screwed-up musical projects – finally succeeded because nothing else than music mattered anymore. In that, the band’s deviant trajectory is not so different from Vox Low’s, another in-house signing. But the most surprising thing about “Not easy to cook” is the sultriness that emerges. 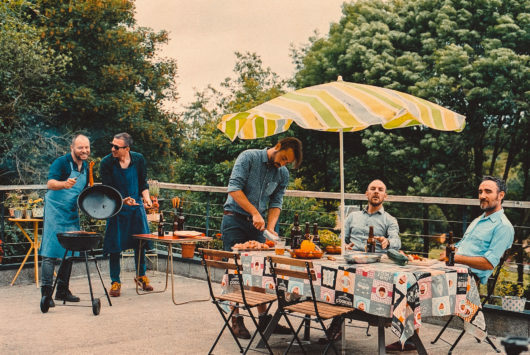 It’s hard to sum it up other than by comparing these 10 songs with some pressure cooker in which bits of dancehall, London ska and Hawaiian dub would have cooked together. Here’s the small miracle achieved by this LP recorded by the band in its remote French village: sounding French, but Polynesian French. With “Not easy to cook”, frogs, birds, sounds from the jungle can be heard in a living room. Those already traumatized by Arthur Lyman’s vibraphone and Les Baxter‘s Lounge music should feel at home; novices will finally discover something other than Saturdays at the Whole Foods Market store.